How easily we can support what we wish to convey or prove! But, can we ensure that we adopt positivity every time? 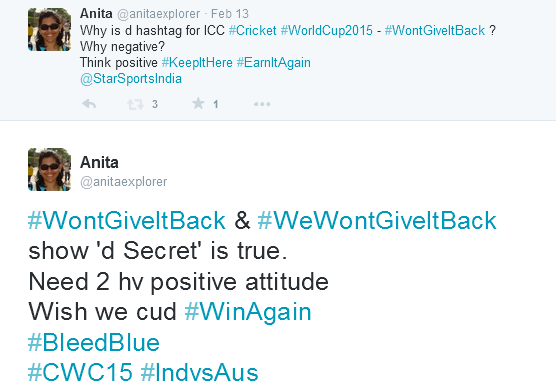 When I first saw that the hashtag and slogan for #CWC2015 was- #WontGiveItBack, I wondered why we do have a negative statement? Today, I sent the above tweet. As per 'The Secret', the Secret is that we must send out positive signals always. Yes, we could have said this and we never know what would have happened! The result is not in our hands. Our thoughts & actions are in our hands. The fact is we all need to employ positivity and make it work its magic in our lives. Many times we are positive, but things don't work out as per our plans or optimistic ways. I am revising this lesson again today. I resolve to be even more positive and #MakeItHappen! The other day, I missed my train due to a terrible traffic-jam despite the fact that I had plenty of time on my hand and was so positive that I will make it to the railway-station on time! "Bade Bade Deshon Mein, Aisi Chhoti Chhoti Baatein Hoti Hain!" English Translation- "In big countries, such small incidents happen." I know that for some die-hard fans, Team India losing a chance to play in the World Cup Finals is not a 'small incident'. But, then, I have learned that just like 'don't cry over spilt milk', don't cry over lost matches or missed trains! Anita, once the news media gets some crazy idea in their head, it gets totally out of control. Positive is the only way to approach life in general. May we all be positive! How easily everyone can blame when a team loses. The same people cheer when they win! Win to loss means change of behaviour & attitude! It is important to be positive in life and all the aspects of it big and small. How we respond to what happens or doesn't happen determines the true outcome of it. Sadly, the media seems to dwell on the negative. Team India should be congratulated on making it to the semi-finals and for games well played. Hopefully, the players know they did their best and celebrate who they are and their journey as a team and move on to ready themselves for next season. Thoughtful post, Anita. Thank you for sharing with us at, In Other Words. May we all celebrate the journey of life with happiness & positivity. Yess, I do not agree with all those who are diverting the attention of the lose to Anushka who has done no wrong. Guess it's typical men mentality to blame all things wrong on an innocent girl /lady. Very true, Anita... I am no more a great fan of cricket after the match fixing issues and after knowing how the other games are neglected due to cricket mania in India. But, somewhere deep in the heart, alway I want India to win in all the games. What happened yesterday was disappointing, both - India's defeat as well as blame on Anushka. It is like blaming the dance floor for not being able to dance. I have something to say here. When everyone was unhappy about losing toss, I felt, 1 day cricket is an unfair game. If we analyze any other games, every team gets alternative chance to play. Even in test cricket match, there are two innings. Why the chasing team is alone supposed to get the pressure in a one day match or in 20-20 match? Why didn't they make it as two innings game? Can that concept create some positive change? Yes, Sindhu. We all want our India to win all the matches! That's not feasible. May the better and more deserving players/team win. Then no blaming the dance-floor! Hope cricket gets improved & other sports also earn deserving attention. Anita.. I was heart-broken too. But no blames... as u said. It is bad. Somedays are meant to be bad and some will be good. There can be 100s of 1000s of reasons for everything. Initially, I have heard people telling that India will not even reach Semi-finals. India fought very well is all i can say! Absolutely Satya. Team India did well. We can only try our best. The loss is disappointing but we will win it back! Lets have a positive attitude. Very well written post Anita! I consoled myself & my daughter with the DDLJ Dialogue. We can progress when we don't look for scapegoats or put the blame on others!